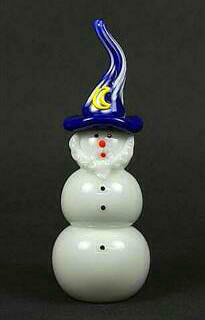 Vitrix glass Wizard snowman. Pictured with the traditional pointed wizard hat in bright blue colors A subtle white beard with red nose and black buttons. Approximately 5.75"h x 2.65"w . Signed Vitrix and dated.